Hark! The herald angels spring. I’d love to be in France today. Not because it’s International Labor Day or May Day, but because I could easily get my hands on a bunch of lilies of the valley. Every May 1st, the French celebrate the white, bell-shaped blossoms in the Fête de muguet or Lily of the Valley Festival. Sweethearts once gave each other bouquets or sprigs of these diminutive sprays on this day. Those in the know still do. You see, it signals the return of happiness in floral speak. The tradition also lives on for this harbinger of Spring Summer as people exchange potted plants of the dainty bubbles peering out from green-sheathed stalks. For its scent, shape, color symbolism and delicate structure, this lily’s an ever-popular, if not expensive, bridal choice. If it’s good enough for Kate Middleton…. A lily of the valley by any other name? OK, I’ll agree with Juliet on this. There’s Lady’s tears (the drooping blooms evoking such), which might explain why ladies wore a stem upside-down on their dresses…the better to catch a glimpse or waft of their inner beauty. And Mary’s tears (for those shed at the cross). 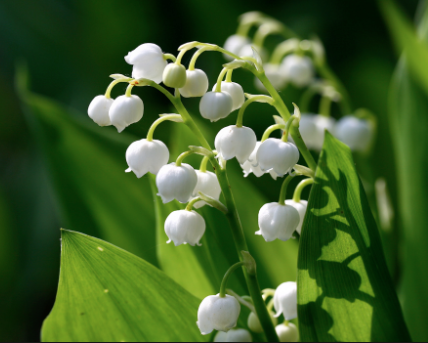 The botanical name, convallaria majalis, meaning “valley” (in reference to its preference for lowland habitats) and “of May” gives us May lily and May bells as alternates. From lush, broad leaves emerge perishable tender hoods. Images of lily of the valley were common on postcards during the mid- to late-1800’s. Yes, floral-obsessed Victorians can claim to be the original flower power culture, often setting out on a lily picnic on Whitsunday (the British associated the LOTV with the return of the Holy Spirit to the Apostles) to gather wild ones in the nearby woods. Aahhh! Alongside fragrant gardenias and hyacinths, the sweetest things.